Fig. 6.2 An analogy for metabolic regulation. The temperature in a thermostatically controlled water bath (the controlled variable) is relatively constant with only small variations around the set-point (the desired temperature), whereas the electrical current flowing through the heater (the controlling variable) varies between much wider extremes. Fig. 6.3 The pattern of glucose metabolism after an overnight fast. The numbers are approximations only, in mg per min, for a typical person of 65 kg body weight. Much of the glucose delivered to peripheral tissues (muscle, adipose tissue, blood cells, etc.) 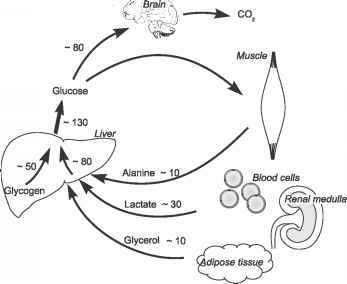 is 'recycled' as lactate, which returns to the liver as a substrate for gluconeogenesis. However, a large proportion is oxidised, especially in the brain, and this constitutes an irreversible loss from the body's store of carbohydrate. Note that this picture shows only glucose metabolism: muscle and other tissues (e.g. renal cortex) will also be oxidising non-esterified fatty acids from the plasma. and leaving the circulation. Where is it coming from, and where does it go? The pattern of glucose metabolism after an overnight fast is illustrated in Fig. 6.3. Glucose enters the blood in the postabsorptive state almost exclusively from the liver, and of this a proportion arises from glycogen breakdown and a proportion from gluconeogenesis. These proportions vary a lot according to how much glycogen there was the evening before - which in turn depends on previous diet and other factors like the amount of exercise taken. Also, there is debate in the literature according to what method is used to measure these two contributions. 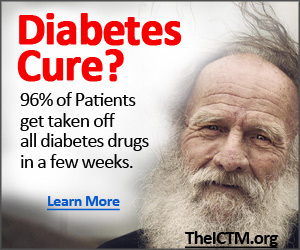 But a reasonable estimate seems to be that about one-third is from glycogen breakdown - say 50 mg glucose per minute. The stimulus for glycogen breakdown (in contrast to the situation after the last meal the previous evening, when glycogen was being stored) is a decreased insulin/glucagon ratio - a little less insulin, a little more glucagon. The remainder of glucose entry (say 80 mg/min) must result from gluconeogenesis. What are the substrates for this gluconeogenesis? Lactate will constitute a little over a half, and alanine (largely from muscle) and glycerol (from adipose tissue lipolysis) most of the remainder. The lactate arises from a variety of tissues. First, it comes from those tissues that use glucose almost entirely by anaerobic glycolysis, such as the red blood cells and renal medulla. Note that this constitutes a recycling of glucose; red blood cells, for example, use about 25 mg glucose/min, and return that amount of lactate to the liver for synthesis of new glucose. Secondly, there will be some breakdown of muscle glycogen releasing lactate from anaerobic glycolysis. The stimulus for gluconeogenesis (again, comparing with the previous evening when it was suppressed after a meal) is again mainly the decreased insulin/glucagon ratio. On the disappearance side, the brain uses about 120 g glucose per day (see Section 4.2) or about 80 mg/min, more than half of the total glucose utilisation. The remainder is used by a number of tissues including red blood cells (about 25 mg/min), skeletal muscle, renal medulla and adipose tissue. The postabsorptive state usually only lasts a few hours before it is interrupted by the arrival of a meal. The first meal of the day gives the most dramatic switch from 'production' to 'storage' mode and we will consider here how this comes about. For simplicity, we will consider a breakfast containing mostly carbohydrate - for instance, cereals and skimmed milk. The carbohydrate of the meal is digested and absorbed from the intestine as described in Chapter 3. An increase in the concentration of glucose in the blood can be detected within about 15 minutes, and continues to a peak at around 30- 60 minutes after a moderate breakfast (Fig. 6.4). (The exact timing depends upon factors such as the size of the meal and the amount of complex carbohydrate, fibre and simple sugars in the meal.) As the concentration of blood glucose rises, the endocrine pancreas responds: insulin secretion is stimulated and the concentration of insulin in plasma rises (Fig. 6.4). The glucagon concentration in 'peripheral' blood (e.g. taken from an arm vein) may fall a little after a typical meal, although we do not know directly what happens to glucagon secretion or to the glucagon concentration in the portal vein. Nevertheless, the insulin/glucagon ratio in plasma rises. How does this affect metabolism in individual tissues? The liver receives the blood draining the small intestine in the hepatic portal vein, and so it sees the largest change in blood glucose concentration. This leads to an inflow of glucose into hepatocytes via the transporter GLUT2. The elevation of intracellular glucose concentration in hepatocytes, together with the change in insulin/glucagon ratio, leads to inactivation of glycogen phospho-rylase and activation of glycogen synthetase, and thus a switch from glycogen breakdown to glycogen storage (see Box 4.1). We might expect that the pathway of gluconeogenesis would be inhibited by this hormonal switch, but this does not occur in practice. 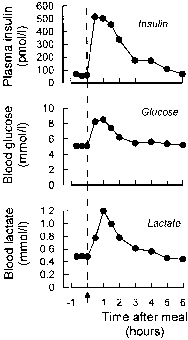 There is always an elevation of the blood lactate concentration after ingestion of carbohydrate (Fig. 6.4). This probably represents the effect of a switch to partially anaerobic glucose metabolism in a number of tissues including muscle and adipose tissue. Fig. 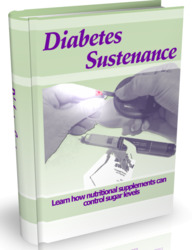 6.4 Concentrations of insulin, glucose and lactate in blood after an overnight fast and following a single meal. The meal, shown by the arrow, contained 96 g carbohydrate and 33 g fat. Mean values for 8 normal subjects are shown; based on data in Frayn et al. (1993). The increase in blood lactate concentration is probably sufficient in itself to maintain the activity of the pathway of gluconeogenesis. The overall effect is that some of the glucose arriving in the blood is used by tissues, released into the blood as lactate, taken up by the liver and converted to glucose 6-phosphate and then glycogen - the 'indirect pathway' of glycogen deposition (discussed in Section 4.1.2.1). It is important to note, however, that unlike gluconeogenesis after an overnight fast, this gluconeogenic flux does not lead to release of glucose into the blood: the glucose 6-phosphate is instead directed into glycogen synthesis. The direction of lactate into glycogen in the liver can all be seen as part of an intense drive to store as much as possible of the incoming glucose, even if it supplies some energy to other tissues first. The rate of glucose release from hepatocytes (i.e. release of glucose from glycogen and from gluconeogenesis) falls dramatically, almost to zero, within 1-2 hours after a glucose load or carbohydrate meal. This is, of course, yet another mechanism tending to reduce the increase in blood glucose concentration that might otherwise occur. At the same time, hepatocytes will take up glucose arriving in the portal vein. Total glucose release into the circulation through the hepatic veins, however, increases because of exogenous (dietary) glucose coming from the small intestine (Fig. 6.5).